The Gargano Promontory in the Puglia region of Italy offers a variety of things to see and do. All in one place, you can find the Adriatic sea with many good beaches, the Foresta Umbra National Park with many hiking trails, plus lakes, medieval towns with picturesque historic centers, important religious pilgrimage sites, and fantastic food. Except in the forest, much of the Gargano is covered with citrus groves and olive trees. The Gargano is a large area and with so much to see, you could easily spend a week or longer here. The Gargano Promontory juts out into the Adriatic Sea in the northeast of the Puglia region, in the Foggia province (see Puglia Map). While Puglia is often called the heel of the boot, Gargano is referred to as the boot's spur. The Gargano Promontory, in the northeast of Puglia, offers a diverse environment with a variety of interesting places to visit including beaches, a national park, and picturesque medieval villages. Continue to Gargano Attractions to find out about the top things to see and do. The closest airport is Bari. From Bari, take the train to Manfredonia to visit Monte Sant' Angelo and southern towns or San Severo to visit the northern coast and towns. Buses connect the towns on the peninsula and a small train line runs from San Severo along the northern coast almost to Peschici with a stop in Rodi Garganico. The best way to explore the Gargano region is by car. 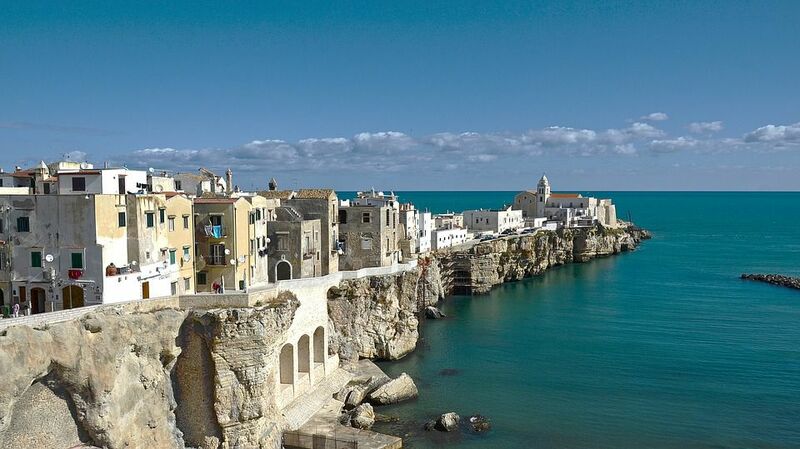 The Gargano Peninsula is off the A14 autostrada that runs along Italy's eastern coast. State Highway SS 89 runs around the peninsula from San Severo in the north to Manfredonia in the south, making all the towns easily accessible. In summer the coastal road between Rodi Garganico and Vieste can be very crowded. Rodi Garganico makes a good base for visiting the northern half of the peninsula. While most hotels along the coast are only open during the summer season, Villa Americana Park Hotel is open year-round. The 3-star hotel has an excellent restaurant, a garden with swimming pool, parking, and a shuttle to their private beach in the summer. The hotel is just outside the historic center above the port. On the coast, the 4-star Hotel Residence Tramonto is open all year and has a good restaurant, a pool, a beach, and a wellness center. Monte Sant' Angelo makes a good base for visiting the south, including the Padre Pio Shrine. Palace Hotel San Michele is a nice 4-star hotel facing the castle and near the historic center, with a swimming pool, spa, beach shuttle in summer, and views of the countryside. Agriturismo la Torre Taronna (site in Italian only) offers bed and breakfast on a working farm in a peaceful location outside Monte Sant' Angelo. Guests have the opportunity to have a learning vacation doing such things as cooking classes, making pasta or liquere, woodworking or basket-making, or gardening. There are a variety of animals and horseback excursions are available. In Vico Garganico, in the hills above the northern coast, there are modern apartments in the newer part of town and four characteristic vacation apartments in the historic center owned by Pino, the English-speaking manager of Pizzicato Bar in town. He spends time with his guests, taking them around town and helping them plan their itinerary. Contact Pino at infobebpizzicato@gmail.com or see Pizzicato Eco B&B for more information. Late April through May is probably the best time to visit when the scent of citrus blossoms fills the air and the many species of orchids and other flowers bloom in the forest. June and September are also good months to go. July and August are the most crowded when tourists flock to the beaches. Easter is also a popular time to visit. Monte Sant' Angelo and San Givoanni Rotondo are visited most of the year although January and February are not recommended.